A short news story tells us about a Palestinian living in east Jerusalem, which is populated mainly by Palestinians, who happens to be associated with Hamas terrorists in Gaza. What he has been doing to help out his cohorts is to use his axe to destroy buildings. He used it to sabotage places where Jews live by hitting gas lines so that they would explode, cause fires and kill people. He was finally caught. A very long time ago Jerusalem was divided into four populated groups; Jewish, Muslim, Christian and Armenian. Today it is a unified city with no partitions and is the capital of Israel. Another name for it is "The City of David," for King David of Israel established this city. David ruled in 1010 BCE to 970 BCE. His son, King Solomon, lived from 961 BCE to 920 BCE. There has always been a Jewish presence in Jerusalem. 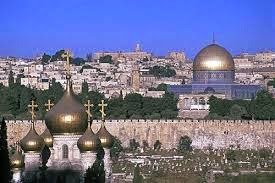 In 2003 there were 693,217 people living in Jerusalem. "1967: The Six-Day War results in East Jerusalem being captured by Israel and few weeks later expansion of the Israeli Jerusalem Municipality to East Jerusalem and some surrounding area. The Old City is captured, or rather-liberated by the IDF. Israel declares Jerusalem unified and announces free access to holy sites of all religions." Until 1967, Jordan had control as it had taken 80% of the Jewish Homeland awarded by the League of Nations illegally. Being they sided with the other Arab nations in the 1967 attack and lost, Israel won it back. From 1948 to 1967, Israel had not been able to come to the Wall, which is such a big part of the Jewish history. At the same time, Moshe Dyan had given the Temple Mount to the Arabs to control, a very big gesture of peace. The Temple Mount is sitting on top of the 2nd Temple site, also most important to Jews. The Mayor of Jerusalem is Nir Barkat who is very much against dividing the city. The Palestinians want to make it their capital. Their idea of a state is one that has not one Jew in it. That of course would mean that all Jews would have to move out of east Jerusalem. Jews would not be able to gain entrance to the wall or other Jewish religious sites in this area. This part of the city would be completely cut off from the rest. As it is, Israel is helping the Arabs of Judea and Samaria in many ways already as they are not financially capable of standing on their own, even for utilities. Did you reverse your figures from 2001 and 2003? There must be a more recent census. The old city must be referring to East Jerusalem where there is a higher population of Arabs. It's a separate number from all of Jerusalem in 2003. I goofed and wrote 2001. It was 2011. Thanks for calling my attention to it. What a difference a 1 makes.